Youth Greening TO extends the opportunity to youth residing in Jane-Finch to learn more about environmental preservation, community involvement, and urban greening. Participants are trained as youth leaders, and are instrumental in organizing and implementing program activities. Their involvement allows them to fulfill their community service hours necessary to graduate high school. Participating in environmental education workshops that emphasize youth’s cooperative learning, critical thinking and discussion and a focus on action strategies with real-world applications. Leading environmental activities, arts and crafts and recreation geared to promoting youth leadership for greening communities throughout Toronto. Leading group planting and greening projects throughout Toronto. 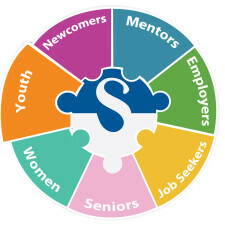 Youth leaders will have the opportunity to mentor other youth in the importance of working in teams, promoting actions that serve the larger good, and connecting with the community. Skills for Change CEO Surranna Sandy with our partners at TD.